Spaghetti alla carbonara is the epitome of Italian cooking's beauty through simplicity. When made correctly it is completely satifsying and delicious yet surprisingly quick and simple, containing only a few ingredients and taking about ten minutes to cook. Unfortunately the amount of variations out there (us Brits are particularly guilty of this) which overload the recipe with piles of butter and cream to make a thick cauliflower cheese style sauce is criminal. 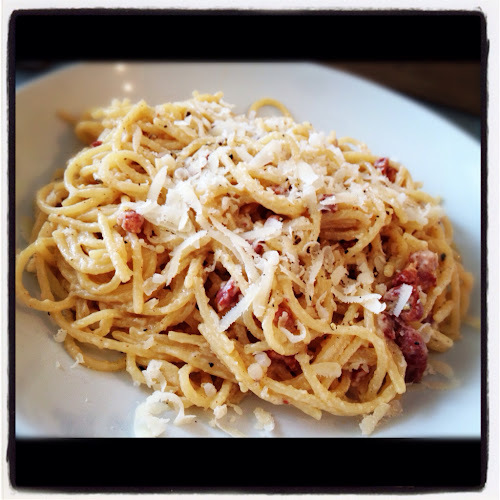 Real carbonara doesn't contain cream. There I said it, out of the way nice and early. The creaminess of the sauce (and it will be creamy if you get it right) comes from the combination of very lightly cooked egg, melting cheese and a little starchy pasta water. Trust me, once you've tried it the authentic way you'll never go back. Before I start, I realise that the strict Roman version doesn't use garlic but I've tried it both ways and I prefer it with. Also, make sure you use fresh free range eggs, proper pancetta, and either Parmigiano-Reggiano or Pecorino Romana cheese (I prefer the former). There's only a few ingredients in this so they have to be the right ones I'm afraid. 1 clove of garlic, peeled then smashed with the back of a knife. Put the pasta on to boil in a large pan of salty water. Meanwhile gently fry the Pancetta on a medium heat with a glug of olive oil in a large, high sided frying pan until crisp. The fat should have rendered out of the bacon a little but aim for crispy, not crunchy. Turn the frying pan down to low and add the garlic, cook gently for a few minutes until lightly brown then remove and discard (it's just there to flavour the oil). In a bowl lightly beat the egg (or eggs) and add the cheese along with a very generous mill of black pepper. When the pasta is al dente drain it briefly over a bowl (so you can reserve some of the starchy cooking water) then add it to the frying pan and stir well to coat it in the bacony oil. Remove the frying pan from the heat and then pour your egg and cheese in with the hot pasta and toss and stir with a wooden spoon or tongs until the cheese has melted and the egg has lightly cooked to create a creamy sauce (I usually do this for approximately 1 minute). If its looking too dry add a splash of the pasta cooking water to loosen the sauce. Serve immediately in warm pasta bowls with extra grated cheese and black pepper as preferred. Believe it or not I don't drink beer with every meal and after a Bank Holiday weekend which was anything but beer free I ate this meal on it's own. However if I was drinking a beer with this then I would probably go for a nice crisp Saison. Something not overly herby but with a nice bit of bitterness, even a touch of sourness, to counteract the richness of the dish and cut through that creamy sauce. A good crisp Pilsner would work well too. This spaghetti semms delicious !